The People's Republic of China has emerged a leading economic power house in the world in the 21st century thanks to it's the Belt and Road initiative, a signature project of President Xi Jinping. 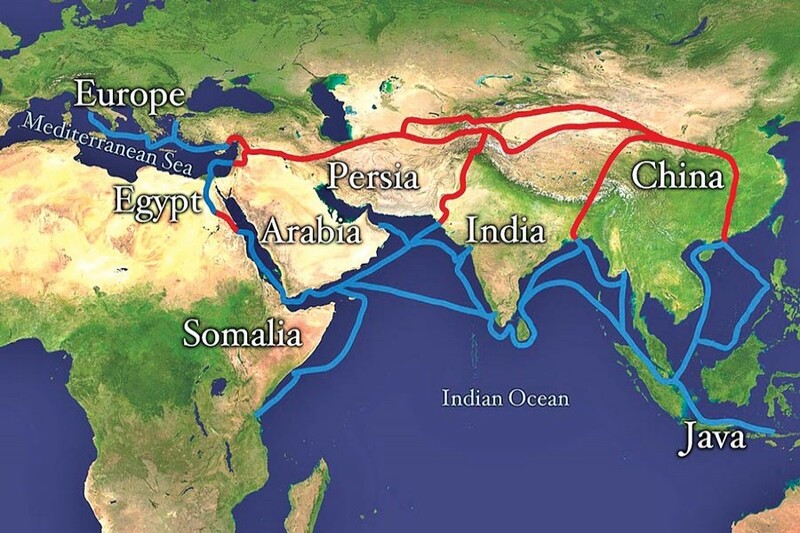 President Xi Jinping's Belt and Road initiative in fact is the revival of ancient Chinese Silk Road and Trade which got going during the period of Han dynasty from 207BCE (Before Common Era) to 220 BC (Before Christ). At the initial stage the Han dynasty through explorer Ambassador at large, Ziang Qian, expanded the Silk route in Central Asia. Trade through the Silk route actually played a significant part in establishing civilisation of China. Chinese Buddhist monk Fa Xian, Hui Zi and Hui Da came to ancient Bengal during the fifth century of Han dynasty to learn Buddhist scriptures. Ancient Bengal was also a place the Chinese trade ships sailed to. During Song and Yuan dynasties Chinese foreign trade further developed. Large quantities of Chinese silk and porcelain were shipped to India, Sri Lanka and Bengal. In fact, trade had expanded through navigational routes to South and East Asia and East Africa from 1405 to 1433 during the Ming dynasty. Admiral Zheng He, a Chinese Muslim (Cheng Ho) - mariner, explorer and diplomat - had made seven voyages during his lifetime. Zheng He earned appreciation of Emperor Yongle of the Ming dynasty. During the Ming dynasty there were frequent exchanges of envoys between China and Bengal. In 1408 Sultan Ghiyasuddin Azam Shah dispatched an envoy to establish relations with China. The envoy was accorded warm reception by the central government of the Ming dynasty. In 1415 the government of the Ming dynasty dispatched Hou Xian as an envoy to visit Suvarnogram, now Sonargaon near Dhaka, with credentials from Chinese emperor Zhu Di. While calling on the Sultan, the Chinese envoy presented the Queen and the Ministers of Suvarnogram with generous gifts from the Chinese emperor. Zheng He's voyage team carried from China things including embroidery umbrellas, silk and Satin, porcelain, camphor, gold, silver, copper, etc. Zheng He's voyage team visited Ceylon, Calicut, the Maldives, Cochin, Koyamyadi and Bengal in 1430. Zheng He did not visit Bengal but his envoy Hong Bao paid a visit to Chattogram and Sonargaon by small boats from Sumatra and presented the Chinese emperor's imperial manifesto. This writer was associated with a group of journalists of China Pictorial during their visit in 1993 to publish a special supplement on the visit of Zheng He to this part of the world. Journalists from China Pictorial visited Chattogram, Sonargaon and met Chairman of Bangladesh Parjatan Corporation to know about expedition of Zheng He to this part of the world. All arrangements were made by this writer. The team was led by Madam Bian Youfen, Deputy Director of China Pictorial. A special supplement was published on Zheng He voyages in 1994. From Han to Tang and Ming dynasties there had been trade between China and all South Asian parts plus Central Asia. Chinese silk, silk cloth, paper, Chinese porcelain were very much liked by peoples of this region. As a matter of fact, Chinese beautiful porcelain was preserved at a small museum of Lalbagh Fort in Dhaka which this writer noticed in mid 60's. UNESCO designated the Chang' an-Tian Shan corridor of the Silk route as a world heritage site. China has been emerging economic power house in the world in the twenty first century from an opium-addicted nation in the nineteenth century. It was introduced by the imperial British Raj of East India Company in 1825 by supplying opium and raw cotton in exchange for tea, porcelain and silk. In 1793, China was known for sophisticated culture and rich history. In 1839 Qing emperor ordered destruction of the large supply of opium stored in China. Commissioner Lin Zexu undertook an expedition to destroy illicit opium and detained the entire foreign community in Guangzhou which in fact led to an "Opium war" between the Chinese and the imperial British. The Chinese lost the war and were compelled to sign the Treaty of Nanjing in 1842. Under this treaty China ceded the Island of Hong Kong to the British while opened five ports to British residence. This treaty was humiliation to China. The treaty was unequal in nature. The Island of Hong Kong was handed over to China on 1st July of 1997 ending 156 years of rule by the British. The National Committee of the Chinese People's Political Consultative Conference held in Beijing in June 2017, however, emphasised an anti-corruption campaign in China and building a moderately prosperous society while deepening reform and advancing rule of law and strictly governing the party. China's economy is targeting a reasonable range of growth between 6.0 and 7.0 per cent. China President Xi Jinping unveiled the Silk Road Economic Belt concept in September of 2013 during his visit to Kazakhstan wherein he proposed that China and Central Asia cooperate to build a silk road economic belt. The ancient silk route included Samarkand, Bukhara and Ghazni in Central Asia. Therefore, President Xi unveiled his dream project in Kazakhstan. During ancient time, trade caravans moved through cities of Kazakhstan from the border of China and moved to Persia as well. President Xi Jinping has not only now revived the old silk route but also expanded it to cover Europe as well. International cooperation in the economic field and connectivity were pledged at the two-day Belt and Road forum on May 13-14 in 2017 in Beijing. Twenty nine countries, including Bangladesh participated in the forum despite India's objection. India which is a part of BCIM- Economic corridor of China delivered an implicit criticism against China because its state-owned companies are working in Pakistan-held Azad Kashmir, the Himalaya region claimed by both sides. It is not understood why the Prime Minister of Bangladesh did not participate in the forum where leaders from Myanmar, Malaysia, Pakistan, Turkey and Russia participated. China in fact has become a major donor country to Bangladesh since establishing diplomatic relations in January of 1976. During the first visit of Chinese President Xi Jinping in 30 years, a loan agreement amounting to $24 billion was signed with Bangladesh in 2016. Prime Minister Sheikh Hasina also visited China three times by now. Bangladesh and China shared defence, economic, political and people to people ties. President Xi in his keynote paper has spoken of openness, inclusiveness of nations, mutual learning through exchange of knowledge and mutual benefit through flow of goods and people as well. President Xi is of the opinion that China does not want to dictate others but he emphasised economic integration and cooperation in financial regulation, anti-terrorism and security. By implication it means China would play a dominant role. The Chinese President said, "We should foster a vision of common, comprehensive cooperation and sustainable security". The President announced a total of $113 billion earmarked for the project of Belt and Road. That includes lending $55 billion by two non-commercial Chinese state banks of the amount, $14.5 billion was earmarked for the Silk and Road fund, set up in 2014. Chinese government has also committed to provide financial aid worth $8.7 billion to developing countries and international organisations as well. China established the Asian Infrastructure Investment Bank in 2014 to finance ports, highways and other projects. China had begun construction of railways in some part of Africa, including Bangladesh. China was awarded a $3.1 billion project contract in 2016 to build a rail network to connect Dhaka with Jashore, a distance of 168 kilometres. It is being designed to run at a speed of 120 kilometre per hour. The rail link project included construction of 66 main bridges, 244 minor bridges plus 14 new railway stations while procuring 100 passenger coaches. China was also awarded a contract to build the Padma Bridge in 2014. The 25-metre-wide and 10-kilometre-long bridge over the River Padma will be built by China's Major Bridge Engineering Company Ltd at a cost of $1.55 billion in four years' time. These projects are part of the Belt and Road Initiative. By implication, China maintains the carrot-and -stick policy while doing business under the Belt and Road project. Political analysts and diplomats are of the opinion that China is trying to create a political clout and an economic network to push the United States out of the region. Mohammad Amjad Hossain, retired diplomat from Bangladesh and former President of Nova chapter of International Toastmaster club of America, writes from Virginia, USA.